Dude! I guess you’re alright for a big ole white torando! I think we will have some fun play time in our future. 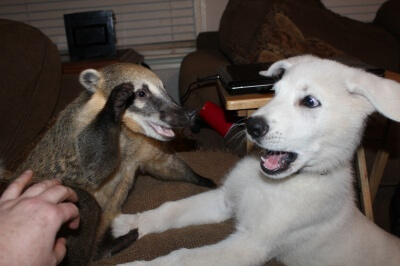 I think even Bonnie likes you and she don’t really like anyone but CoatiDaddy. Maybe one day Lucky will come around…He brags about being the muscle man around here but he sure moves that giant behind up the nearest tall thing he can climb..(*chuckles* )when you come in the room…Hey that’s a thought! A new Puppy exercise program for Lucky….We’ll get that boy trim and fit in no time! Look at that puppy face! Priceless! I can’t believe you were able to catch that look of surprise, it looks almost animated. Previous Previous post: Not on my watch! Next Next post: Who do you think you are fooling??? ?